This is a collaboration between Vegas Golden Knights writers Thomas Conroy and Shayna Goldman analyzing the 2017 Expansion Draft by division. The Atlantic Division preview can be found here. All 30 NHL franchises must abide by a number of parameters set by the National Hockey League for this expansion draft. There are requirements for both exposing and protecting players. All first and second-year professionals are exempt from the draft, as are players on long-term injured reserve (LTIR). Players with active no-movement clauses (NMC) must be protected as well, unless they were asked to waive the clause. Teams face a deadline to buy out players (which can be used to avoid protecting a player with a NMC) on Thursday, June, 15. First, all teams must meet the exposure requirements or face sanctions from the league. Teams must expose at least two forwards and one defenseman that are signed through the 2017-18 season, that played at least 40 NHL games in the 2016-17 season or 70 games in the last two seasons. At least one goaltender that is either under contract for next season or is a pending free agent (that received his qualifying offer from their team before the protection lists are submit) must be exposed as well. 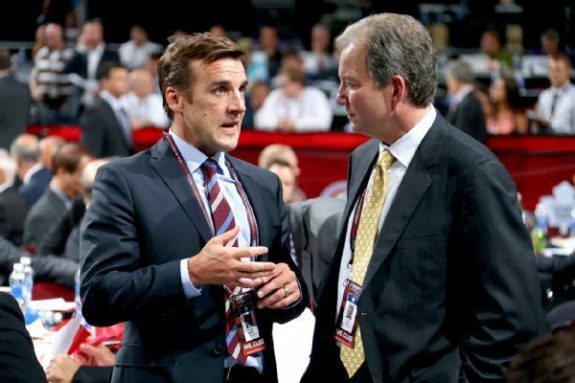 Golden Knights general manager George McPhee does not have to select these players that are exposed to fulfill the requirements, but he must have the option. The next couple of weeks will be important for both McPhee and the inaugural season of the Vegas Golden Knights. Along with meeting those requisites to be exposure-eligible, teams must follow rules for protection as well. Teams have to submit a protection list to the league by 5 p.m. EST on June 17. Those protection lists can follow two structures: protecting seven forwards, three defensemen, and one goaltender (7F/3D/1G); or a combination of eight skaters and one goaltender (8FD/1G). The Hurricanes will likely protect 7F/3D/1G for the expansion draft. Their only player with a NMC is Jordan Staal. 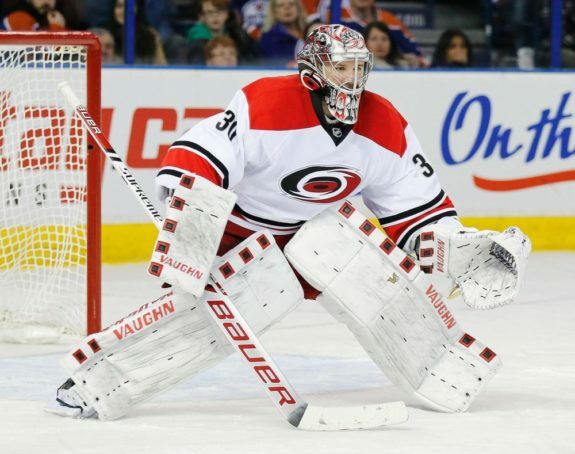 Along with Staal, Jeff Skinner, Victor Rask, and Elias Lindholm will likely all be protected. Forwards like Phillip Di Giuseppe, Teuvo Teravainen, and Andrej Nestrasil are other protection options to fill the seven slots. If so, they will meet the exposure requirements because both Lee Stempniak and Joakim Nordstrom are signed through at least next season. On defense, Justin Faulk is the most likely option to be protected to remain in Carolina. Klas Dhalbeck and Ryan Murphy could join Faulk as protected defensemen. As long as both Faulk and Dahlbeck are protected though, general manager Ron Francis is going to have to either re-sign one of their pending free agents or acquire another defenseman. Four of Carolina’s goaltenders are signed through next season: Scott Darling, Cam Ward, Eddie Lack, and Daniel Altshuller. Their only pending free agent in net is Michael Leighton. Regardless of who is protected, they will still meet the NHL’s requisitions for exposure. Once the Hurricanes traded a third-round pick to the Chicago Blackhawks for Darling and re-signed him to a four year, $16.6 million contract, either Ward or Lack’s future in North Carolina was put in jeopardy. Neither Ward nor Lack have particularly substantial contracts (Ward has a $3.3 million cap hit, while Lack’s cap hit is $2.75 million – both for one more season), but they are not necessarily the most attractive draft candidates for Vegas. Since McPhee has expressed his willingness to absorb substantial contracts in exchange for valuable assets, the Hurricanes may have an opportunity to move a goaltender. Francis could offer McPhee one of their prospects or many draft picks to claim one of their netminders. This season, the Hurricanes have all of their draft picks other than their fifth-rounder, along with the Penguins’ and Rangers’ second-round picks, Devils’ third-round pick, and the Bruins’ fifth-round pick. The Blue Jackets have a number of assets on offense that they will look to protect, which is why they will likely look to protect as many as they can by following the protection scheme of 7F/3D/1G. With Brandon Dubinsky, Nick Foligno, and Scott Hartnell all with NMCs, there are only fourth other protection spots for their forwards. Hartnell waving his NMC seemed plausible because he has a cap hit of $4.75 million through 2019, while playing on the fourth line. However, it was ultimately decided that he would not be asked to waive his clause. Still, Hartnell’s contract could be bought out before the draft to open a spot on offense, since the Blue Jackets find themselves in a crunch to protect all of their assets. If Hartnell is retained though, the four other protected forwards could be Brandon Saad, Cam Atkinson, Boone Jenner, and Alexander Wennberg. This leaves Josh Anderson exposed, though, and he has been featured in rumors surrounding the expansion draft. There has been speculation of a trade with Vegas involving David Clarkson. Although Clarkson is on LTIR and is exempt from the draft, his cap hit affects the Blue Jackets’ salary cap in the offseason – stunting their options until the season starts. This would cost the Blue Jackets a high price, such as a draft pick and a prospect, but it could leave Anderson in Columbus. As for their defense, the Blue Jackets will likely protect Seth Jones, David Savard, and Ryan Murray. Because Jack Johnson is signed through 2018, they do not have to do any additional transactions for their exposure status. Sergei Bobrovsky, who also has a NMC, will be their only protected goaltender. Behind Bobrovsky are Joonas Korpisalo, Anton Forsberg, and Oscar Dansk – all of whom are signed exposure eligible. If not Anderson, or some sort of deal involving Clarkson, then Korpisalo is an option for the Golden Knights in the draft. The Devils should be set for expansion and not require any additional transactions for exposure purposes. Taylor Hall, Travis Zajac, Kyle Palmieri, and Adam Henrique are the four players signed through 2017-18 that will likely be protected. Michael Cammalleri and Devante Smith-Pelly are signed through next season, so if they are both exposed the Devils will meet the requirements on offense. On the other hand, if either of those players is protected as well, then the Devils will have to re-sign a pending free agent or acquire an exposure-eligible forward. With five players signed through next season on defense, the Devils can protect whichever players they want without issue (likely Andy Greene, John Moore, and Damon Severson). Cory Schneider may not have a NMC, but he is a lock for protection. Scott Wedgewood is a pending restricted free agent this offseason, which qualifies him for the exposure requirements, since Keith Kinkaid is a pending unrestricted free agent. None of the Islanders with NMCs (John Tavares, Andrew Ladd, and Johnny Boychuk) were asked to waive their clauses and since none of these players seem like candidates for buyouts, they will be protected at the draft. With 12 forwards signed through 2017-18, the Islanders have the flexibility to choose whichever other five forwards they want to protect in addition to Tavares and Ladd (assuming they go with the 7F/3D/1G scheme). 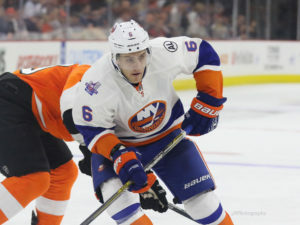 Five defensemen are signed through next season, which means that the exposure requirements will not influence the Islanders’ decision at the expansion draft. The Islanders’ focus for the expansion draft has to be on their defense. Along with Boychuk, Nick Leddy is going to be protected, leaving them with one spot for either Travis Hamonic, Thomas Hickey, or Calvin De Haan. Whoever of these three defensemen is exposed is at risk of being drafted. Also at risk are young defensemen like Ryan Pulock and Adam Pelech. As for their goaltenders, Thomas Greiss will be protected, leaving Jaroslav Halak (signed through 2018), Christopher Gibson (pending restricted free agent), and Jean-Francois Berube (pending unrestricted free agent) exposed. On offense, the Rangers only have one NMC to work around, and that’s Rick Nash’s. Along with Nash, Derek Stepan, Chris Kreider, Mats Zuccarello, J.T. Miller, Kevin Hayes, and Mika Zibanejad are likely to be protected. A forward could be moved, though, to help the Rangers acquire a defenseman, opening a roster spot to Oscar Lindberg. As it stands though, they do not meet the requirement, as the only eligible exposed forward is Michael Grabner. The Rangers have to re-sign a pending free agent or acquire another forward before the draft to meet the requisites. As for their defense, the Rangers have two NMCs – Marc Staal and Dan Girardi. Neither was asked to waive his clause, but one may still be bought out before Thursday. If not, both will be protected along with captain Ryan McDonagh. Luckily, rookie Brady Skjei is exempt from the draft and Brendan Smith is a pending unrestricted free agent. Regardless of his NMC, goaltender Henrik Lundqvist would be protected by the Rangers. This leaves Antti Raanta exposed, though. It has been speculated whether he will be moved by the Rangers. Already, the Calgary Flames and Winnipeg Jets have expressed interest in Raanta. If the Golden Knights are interested in him as well, the Rangers could ensure he is left available by the draft either in exchange for something, or as a way to protect their other exposed assets. Since Mackenzie Skapski is a pending restricted free agent, the Rangers will still abide by the exposure parameters regardless of whether or not they trade Raanta. The Flyers have made some transactions with expansion in mind. Already the Flyers had Claude Giroux with a NMC. At the trade deadline, they traded Mark Streit (who was ultimately moved to the Pittsburgh Penguins) to the Tampa Bay Lightning for Valtteri Filppula, who had a modified no-trade clause along with his NMC, because the Lightning did not want to be forced into protecting him at the draft. Even with the NMCs of Giroux and Filppula, the Flyers have eight other forwards under contract for next season, allowing them to protect whichever forwards they choose without the stress of the exposure constraints. Shayne Gostisbehere, Radko Gudas, and Brandon Manning are the most likely defensemen to be protected. Andrew MacDonald’s contract extends through 2020, which fulfills the minimum requirement for exposure. Prior to the trade deadline, the Flyers re-signed Michal Neuvirth to a two-year, $5 million contract. Both Neuvirth and Steve Mason were pending unrestricted free agents, which automatically exposed their third goaltender (Anthony Stolarz, a pending restricted free agent). Since the Flyers intend to protect Stolarz, they had to re-sign one of their netminders. The Penguins have three forwards with NMCs (Evgeni Malkin, Sidney Crosby, and Phil Kessel). Other than Malkin, Crosby, and Kessel, the Penguins have five other forwards signed through next season. In order to meet the requirements without executing any other transactions, the Penguins cannot protect all five of their signed forwards and have to leave at least two exposed. Kris Letang is the only defensemen with a NMC in Pittsburgh. Along with Letang, Olli Maatta will likely be protected. The third protected spot is likely going to go to either Ian Cole (signed through 2018) or Justin Schultz (pending restricted free agent). If Cole is protected, then the Penguins have to make themselves exposure eligible. But if Schultz is protected, then they meet the requirements without any additional transactions. Matt Murray took over as the starting goaltender this season, as well as later in the postseason. Since Murray is officially the Penguins’ starting goaltender, Marc-Andre Fleury no longer has a role past backup. But since the Penguins do not have a third goaltender to meet the requirements, they would either have to add a goaltender, expose Murray, or ask Fleury to waive his NMC. A day after winning the Stanley Cup with the Penguins, Fleury agreed to waive his NMC for the expansion draft, but only for the Golden Knights. The Capitals have a number of expiring contracts to consider when planning for the expansion draft, but no players have an active NMC. With or without a NMC, Alex Ovechkin and Nicklas Backstrom are certainly going to be protected. Evgeny Kuznetsov and Andre Burakovsky, who are both pending restricted free agents, are going to be protected as well. Even after protecting two pending free agents though, the Capitals cannot protect all of their signed players. If they protect Marcus Johansson, Lars Eller, and Tom Wilson, then they will have to pursue another forward to be exposure eligible. With defensemen signed through next season, the Capitals have options in who they protect. In net, Braden Holtby will definitely be protected, which leaves Pheonix Copley (pending unrestricted free agent) and Philipp Grubauer (pending restricted free agent) exposed. Since Grubauer is thought of as a commodity, one that was originally drafted by McPhee, he could be a valuable draft selection for the Golden Knights.